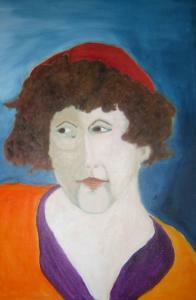 A portrait of Ruth Lepson by Celia Gilbert. The two poets met as MFA students at Boston University. For all the years that Randy Susan Meyers counseled male batterers, there was one question that stuck with her. “What about the children?’’ she wondered. “They were sleeping’’ during the violence was the batterers’ frequent refrain. Yet Meyers knew that violence in the home reverberates beyond the dark of night. A resident of Jamaica Plain, Meyers has some experience with domestic violence. Her memory is hazy because she was only 4 when her father tried to kill her mother. Her older sister brought up the harrowing incident one time when Meyers was talking about her job and ruing the lack of services for the children of batterers. Her sister said, “Why don’t you write about us?’’ What if their mother had been murdered that awful day? What would have happened to them? Meyers started writing, drawing on her familiarity with the world of batterers to produce a story that could have been ripped from the day’s headlines. Her debut novel “The Murderer’s Daughters’’ (St. Martin’s) is a gripping tale of sisters Merry and Lulu struggling for 30 years to find their way in the world, one devoted to their imprisoned father, the other enraged at him. On Thursday, fellow writers will toast Meyers at a book launch party, as will Joan Wallace-Benjamin, chief executive of The Home for Little Wanderers. Meyers will donate proceeds from book sales that night to the social service organization for its Harrington House, a residential program that serves children like Merry and Lulu. The event will take place at Bella Luna Restaurant in Jamaica Plain from 7 to 9 p.m.
You don’t have to wait until Poetry Month for some fresh lines. Poets Celia Gilbert and Ruth Lepson, who met as MFA students at Boston University and share a publisher, will give a reading at 7 p.m. Thursday at Brookline Booksmith. Musical interludes will punctuate Nick Flynn’s readings at 7 and 9:30 p.m. Wednesday at Café 939, Berklee College of Music’s student-run coffeehouse. Flynn’s new book “The Ticking is the Bomb’’ (Norton) weaves together his meditations on impending fatherhood, the demons of his childhood, and his outrage over torture and the Abu Ghraib photos. As he wrote “Ticking,’’ Flynn, a native of Scituate, was approaching 42, the age at which his mother killed herself, and his father descended into homelessness and crime. Flynn moves among a number of worlds, his poems having appeared in The New Yorker and his name popping up in People magazine in mentions of actress (and longtime sweetheart) Lili Taylor.